Home > Guidance on the clinical management of acute and chronic harms of club drugs and novel psychoactive substances. Novel Psychoactive Treatment UK Network. Abdulrahim, D and Bowden-Jones, O [Public Health England] . (2015) Guidance on the clinical management of acute and chronic harms of club drugs and novel psychoactive substances. London: NEPTUNE. 335 p.
For the purposes of this document, ‘club drugs’ is a short-hand term used for convenience to refer to a group of psychoactive substances typically used in dance venues, house parties, music festivals and sometimes in a sexual context. The term therefore describes a diverse group of substances with different actions. They include substances with primarily stimulant effects, those with primarily hallucinogenic effects, as well as some central nervous system depressants and synthetic cannabinoids. Club drugs include substances well established in the UK such as MDMA (ecstasy), as well as the rapidly expanding range of novel psychoactive substances (NPS) such as synthetic cannabinoids, synthetic cathinones and a range of other amphetamine-type stimulants. Some club drugs are sold on the illicit market, whilst others are sold as so-called ‘legal highs’. 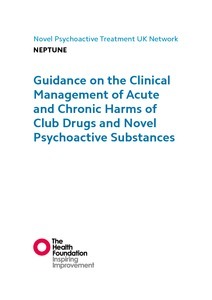 This document provides guidance on the clinical management of harms resulting from acute intoxication and from the harmful and dependent use of club drugs and NPS. It categorises club drugs broadly according to their clinical effects: depressant; stimulant; hallucinogenic. In addition, the synthetic cannabinoids are treated as a separate category, largely for reasons relating to their clinical management but also because they do not fit neatly into that threefold categorisation. The guidance is based on available evidence and clinical consensus. It is a response to the current gap in knowledge and experience in the management of these drugs across the UK and beyond. This document provides guidance, not guidelines. Together with the recommendations of its reviews, technical appraisals and standards, national guidelines produced by the National Institute for Health and Care Excellence (NICE) determine the wider principles within which treatment and care should be provided within drug services, EDs, primary care, sexual health and mental health services in the UK. However, these guidelines do not relate specifically to NPS. NEPTUNE guidance must be used within the wider principles of national guidelines. Non-UK readers of this document should contact their local, regional or national poisons information service for up–to-date advice and guidance on the management of acute club drug intoxication and withdrawal.